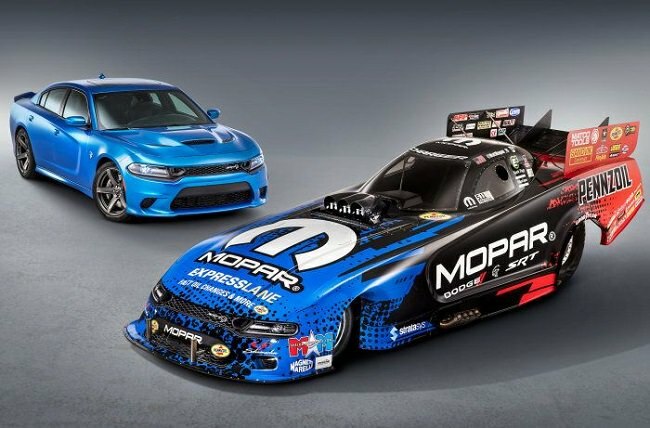 Mopar introduced their new funny car body for the 2019 model year, which takes on the appearance of the 2019 Dodge Charger SRT Hellcat – effectively replacing the Charger R/T funny car that has dominated the class since hitting the track back in 2015, reports Torque News. Over the past three NHRA seasons leading up to 2018, Don Schumacher Racing has dominated the funny car class with the Dodge Charger R/T race car, but this season hasn’t gone quite as well as the past three. Perhaps with that in mind, Mopar and Don Schumacher Racing have teamed up to design the 2019 Dodge Charger Hellcat funny car body, with DSR driver Matt Hagan being the first to run this new body when the cars hit the track this weekend at the Dodge Mile-High NHRA Nationals Powered by Mopar. Some people will be quick to point out that the 2019 Dodge Charger Hellcat funny car really has little connection to the 2019 Dodge Charger SRT Hellcat street car, but the look of the 707-horsepower sedan is featured across the face of this new race car. Whereas the previous Charger R/T body had the front window dressing to provide the look of the 2015 R/T front end, this new car has the Hellcat-style front end stamped across the nose of the race car. This includes the new grille design with enlarged outlets on both sides – although the grille on the funny car doesn’t actually do anything – other than look cool. While the aesthetic design of the 2019 Dodge Charger Hellcat funny car is the easiest change to see in pictures, this new race car isn’t just a new paint job. DSR and Mopar worked together to improve the carbon fiber and Kevlar body, making changes to the lower portion of the nose, tweaking the sculpting along the sides and changing the “burst panel” above the engine to more adequately relieve pressure under the body in the event of an engine failure. Last edited by MagnumClub; 08-06-2018 at 11:33 AM. Any top fuel funny car is bad a$$ but it makes it even more so with a Charger body. why are there russian ads almost everywhere?